by Margaret Chamberlain won a 3-Stars Award at BIAFF 2010. My video From Rails to Sails was a repeat of the trip which I took eight years ago to England on the QE 2. After a rare virus thirteen years ago which has affected my leg I find flying is not the best way to travel. My choice is to use the train and ship. My main purpose in 2008 was to visit my ninety three year old mother who was slated to have a knee replacement. I decided to travel to England so that I could be with her and give her some help and support. I was lucky to have a traveling companion from Victoria to share the journey with me. This was her first Trans-Atlantic crossing and she was thrilled to be doing it with me. Queen Mary 2 is a transatlantic ocean liner and flagship of the Cunard Line. At 1,132 ft (345 m) long by 135 ft (41 m) wide at the waterline, she remains the largest ocean liner (as opposed to cruise ship) ever built.It is 236.2 ft (72.0 m) from keel to funnel. 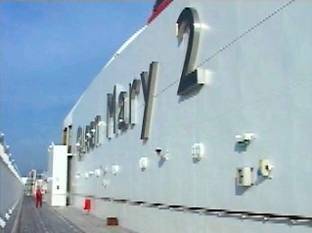 Queen Mary 2's facilities include 15 restaurants and bars, five swimming pools, a casino, a ballroom, a theatre, and the first planetarium at sea. There are also kennels onboard, as well as a nursery. More than 5000 specially-commissioned works of art are visible in the Queen Mary 2's public rooms, corridors, staterooms and lobbies, having been created by 128 artists from 16 different countries. We left Victoria, BC and took the Clipper catamaran boat over to Seattle in the state of Washington, U.S.A. This is a pleasant journey taking two and a half hours. The boat lands at the dock which is just around the corner from the AMTRAK train station. After an overnight stay in a hotel we boarded the train and we were soon settled into our handicap carriages. The handicap carriages are six feet by nine they have an ample shower room, toilet and wash hand basin. I find the service on AMTRAK very good. The steward was very accommodating and pleasant, greeting me with two small bottles of Champagne on my arrival. The trip across the States takes three nights and almost four days. It's a wonderful way to enjoy the landscape across this vast country. The dining car is comfortable. I like the idea of white tablecloths and napkins. Drinks from the bar are extra. Traveling by train is a relaxed way to travel and jet lag is obsolete. There is an observation carriage, where one can sit in arm chairs and view the scenery in comfort. All AMTRAK trains change in Chicago. On our arrival in Chicago we were taken into the first class lounge in wheel chairs and two hours later we boarded the train to New York. "Mrs. Chamberlain guess who had your luggage, Jane Russell!" This is my claim to fame with a real live film star. Jane Russell as she appeared in the trailer for Gentlemen Prefer Blondes (1953). After a day in New York we were looking forward to boarding the luxury liner, the QM2. This is the biggest and most luxurious liner ever built. When we got to the dock I had to tape the liner in small parts. One cannot get close to actually show the size of this magnificent mammoth Queen. She is protected by buildings all around her. I took as many shots as I could so that I could tell the story of my trip, like any story there should be a beginning middle and an end. One needs as many close ups for cutaways as one can get to make the editing easier and to avoid jump cuts. My advice is to take as many shots as you can, vary the camera angles, one cannot have enough close-ups. Take numerous shots pertaining to the topic and the area to help in the editing process. I never seem to have enough shots. I did not use a tripod on board. This is against my principal because I hate to see unsteady shots in a production. I use a cane and my tripod is heavy, not too convenient to carry around such a mammoth ship. 1 made sure I steadied myself wherever I could, sitting on chairs or leaning against posts, and there were many posts to use as a stabilizer on this magnificent ship. I have two Sony digital cameras the Sony_ VX2000 and VX2100. These are wonderful cameras with good lenses and extra super steady shot. The LCD screen is easy to see and is two by one and a half inches, with sound. They have 3 chips. I like the size it's large but not heavy, it's about three pounds eight ounces. I have large hands so it's easier for me to use. The controls are easy to see. I personally like to feel I have a camera in my hands. One complaint about the camera is the battery has to be charged in the camera. A valid reason to have two cameras. I have a solid camera case which my young grandson gave me one Christmas many years ago. He told me he got it from a garage sale for fifty cents. I put some padding inside and it's been marvelous and protects my camera beautifully. I can sit on it and it doesn't really look as though I have an expensive camera inside. Why tempt thieves? I edit on the Casablanca Prestige, version 7. This is easy to use with many transitions a good array of fonts for titling and special affects. It has six sound tracks and one can work on thirty projects at a time. The machine is expensive but after using a Casablanca Avio a few years ago I wanted to replace the machine with one I was familiar with and which I could burn DVD'S on.